There are many reasons to seek diamond appraisals. You may have inherited a ring that you need know the value of or want a replacement valuation for insurance purposes. Whatever the reason, getting a good appraisal is an important part of buying a diamond. Diamond appraisals are normally done by people who are certified by one of several appraisal organizations. These appraisers are trained to evaluate a diamond according to a set standard. They then assign a current value based on many variables. The appraised value is somewhat subjective. A particular ring may be appraised slightly higher or lower depending on who the appraiser is and their personal opinion of the diamond. If you have a ring appraised at the store where you buy the diamond, for example, the appraiser would potentially assign a slightly higher value than an independent appraiser. The only time that this might become a problem is if you were dealing with a jeweler that was not completely ethical and inflated the value of the diamond. It is always important to get diamond appraisals from jewelers that have good reputations and are recommended by people you know. It is important to understand the difference between a certification and an appraisal. A diamond is certified by a licensed gemologist. The gemologist will analyze the stone closely in a lab and give it a particular rating. That rating will ultimately have an effect on the cash value of the stone but does not set the cash value. Only a loose stone can be certified. An appraisal can be done by almost anyone and the appraised value will depend on many different variables. These variables can fluctuate from month to month. Appraisals can be done on loose or mounted stones. Many people mistakenly think that there are only one or two types of appraisals when actually there are several different types. An insurance replacement appraisal is generally done to figure the replacement cost of the ring or piece of jewelry. The appraiser will look at the item to decide how much it would cost to replace the item with another item exactly like it. 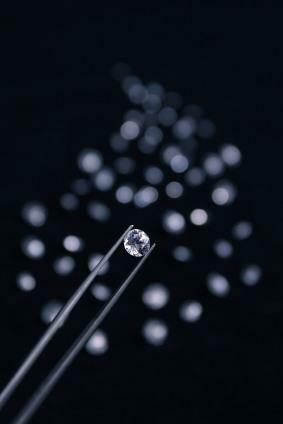 Loose diamonds cannot be appraised for insurance value because they cannot be insured. A probate appraisal will be done to establish a value on the item to figure estate taxes. When appraising an antique ring the appraiser will consider the provenance. The value can be increased beyond the value of the materials if the ring belonged to someone famous or is special in some way. The last type of appraisal will figure the actual cash value of the piece. If the diamond is loose an appraiser will look at it through a loupe or microscope. He will check for inclusions and other impurities in the stone, as well as overall color, weight, and clarity. During diamond appraisals a jeweler will look for chips and other weaknesses in the cut of the diamond. Clarity addresses the purity of the diamond. Carat addresses the weight of the diamond. Cut will address how the diamond was cut and finished. This has a direct effect on the brilliance, or fire of the stone. Color addresses the color of the diamond. The color will be taken in to consideration when appraising diamonds whether the diamond is white, canary, or chocolate. The appraiser will make notes on each observation. He will then type up a report based on the notes which describes the diamond in detail and finally giving his personal evaluation of the diamond. It is important to have diamond appraisals done every few years to keep up with the rising values of diamonds and precious metals. By doing this your information will always be current for your insurance needs.